At the Valois "See Your Food" cafeteria on Chicago’s South Side, black and white men gather over cups of coffee and steam-table food. 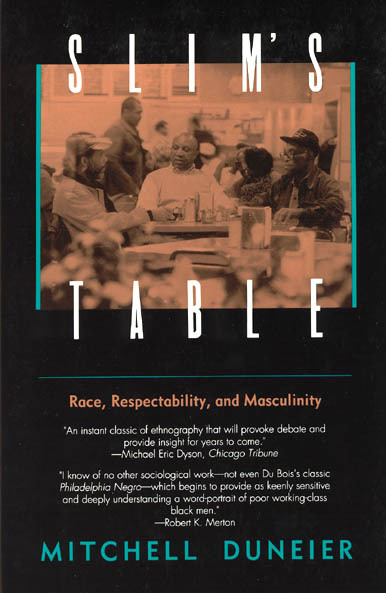 Mitchell Duneier, a sociologist, spent four years at the Valois writing this moving profile of the black men who congregate at "Slim’s Table." Praised as "a marvelous study of those who should not be forgotten" by the Wall Street Journal,Slim’s Table helps demolish the narrow sociological picture of black men and simple media-reinforced stereotypes. In between is a "respectable" citizenry, too often ignored and little understood. 3. Valois as a "Black Metropolis"
Pt. Four: You’re White, He’s Black, I’m a Sociologist: Who’s Innocent?